Many black Americans feel an inborn desire to connect with the motherland, with Africa, as they move through a society that constantly reminds them that their history was stolen. I already feel that sense of closeness—at least to my father’s side of the family. On Google Maps, I can locate the exact village of Ogidi where my family goes back for generations. It is also the birthplace of the late Nigerian writer, Chinua Achebe, who wrote Things Fall Apart. My ancestry didn’t feel stolen from me; I could literally read about my motherland and ask my dad questions about our culture. I could also travel there to visit my family, including my grandmother, who still lives in Nigeria. But my last trip to Nigeria, in summer 2017, made me feel like I would never be able to fully access my culture—reinforcing, for me, the pain of diaspora. Two weeks before going with my dad to visit Ogidi, I was at my commencement ceremony. 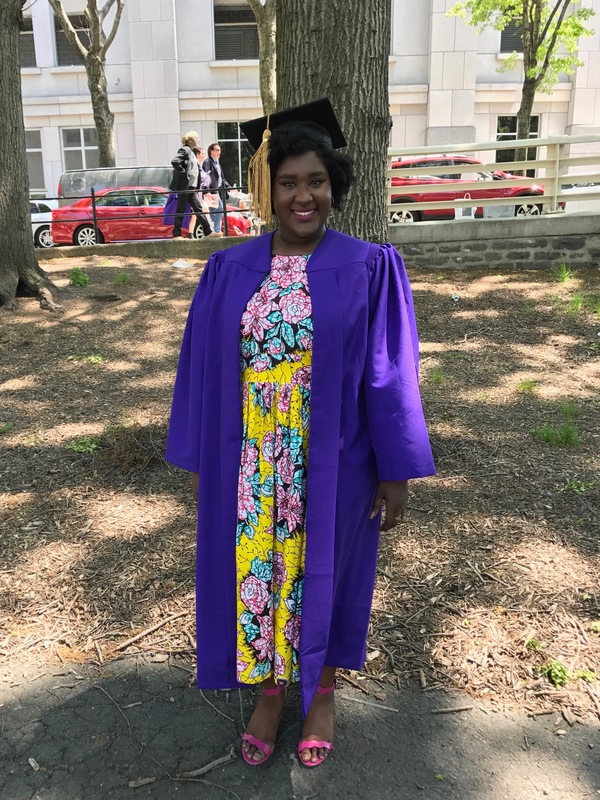 I wore a dress made of Ankara fabric with a modern print I ordered months in advance from Nigeria, my hair carefully molded around my graduation cap. Having given up over a decade of relaxers, heat damage, and the constant reminders not to sweat my hairstyle out, I committed to wearing my natural hair for at least part of the year. With my limp and damaged hair snipped away, I not only saw my own hair for the first time as an adult, I saw it as going back to my roots. My father was born and raised in Nigeria, my mother is a biracial second-generation Newyorican, and I find myself somewhere in the middle as Nigerian, Puerto Rican, American. My hair and appearance, however, are unambiguously black. I already felt some trepidation about traveling back to Nigeria. I hadn’t stepped foot there in nine years and had since stopped eating meat, so my food choices were going to be limited. There is rarely running water, electricity is not guaranteed, and the mosquitoes are even more blood-thirsty than the ones in Miami, my hometown. Life is different there, and I stood out like a sore American thumb. I looked foreign; my clothes and my mannerisms easily gave me away. On top of that, I don’t speak more than 10 words of Igbo. And this time, something else set me thousands of miles apart—my natural hair. In retrospect it seems silly, but I was surprised. Everyone, from young women my age to much older men, felt comfortable sharing unsolicited opinions about something very personal to me. I already knew natural hair was looked down upon in many parts of the African continent. An unfortunate product of colonization, the whitewashed internalization of Afrocentric features as unbeautiful is to be expected. But I underestimated its presence in Nigeria. One of the most surprising reactions came from a complete stranger. In need of some internet, I found myself paying by the hour in an internet café. It was scorching hot and I sat at a computer station by the fan, the breeze it generated blowing through my hair. My hair was mostly rolled onto itself, some of it left loose. “Is that how you normally do your hair?” the employee who ran the café asked me. “Yes.” He looked at me, his face puzzled. “You should coil it. I don’t like it that way.” I didn’t know what to say, and I remember draping a scarf I was wearing over my hair to avoid the unwanted attention. Back in the U.S., I frequently wore scarves around my head as an accessory and never thought twice about it. He again approached me to comment about my appearance. “You look like a Muslim.” I was among Igbos in the Christian south of Nigeria—at best, this was a warning. Before this, I had never been self-conscious about changing my hair. There are times I spend hours installing Senegalese twists on myself or drop money on wigs just to spice things up. But that year I came to love my natural hair. 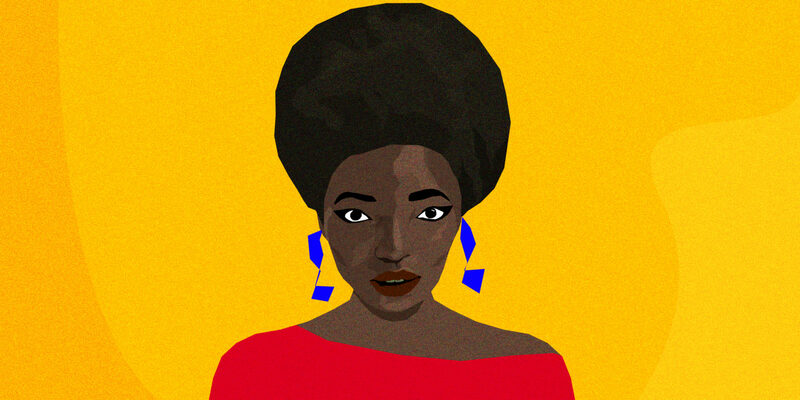 I wasn’t just proud of my 4c hair: in Nigeria I found myself fiercely protective of it. It was tiring, but I constantly rejected offers to get my hair done. To those who I thought would listen, I explained the natural hair movement in the U.S. that I had become a part of. In the ideal situation, I would have been okay with getting my hair done, but in actuality, it felt forced. Before I knew it, I was sitting in a chair at my grandmother’s house as the hours passed and the sun started to set. A woman from the market had come to do my hair. Even though she kept me entertained with funny videos she had downloaded on her phone, she couldn’t help but complain that my hair was too thick and difficult to work with. There I was on African soil, visiting members of my African side of the family, and my appearance was still too unruly, my hair still too black. I thought I might experience a deeper connection to my motherland on this visit. Instead, the trip was having someone smack their teeth and redo the braid they were working on. It was several people leaning toward me slowly speaking Igbo as if talking to a child. I would remind them again that I could not speak nor understand the language. I felt, for the first time, like I was not Nigerian at all. 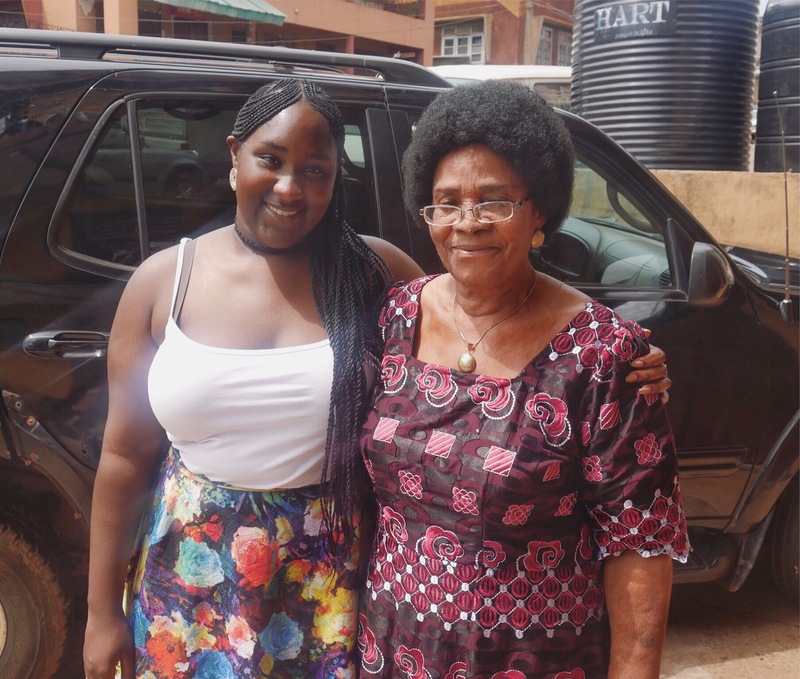 My experience in Nigeria reminded me of a story my mom recounts every once in a while. When she and my father were engaged to be married, her parents were very supportive, but many of her friends and family were less than happy about their union. There was an assumption that my dad, having emigrated to the U.S. two years earlier, was just looking for a green card. One aunt in particular was upset at the thought that their marriage would dirty the Puerto Rican race and produce children with dark skin and “nappy” hair. Miami is predominately a Latinx city, but more specifically Cuban and, even more specifically, Cubans who perceive themselves as white. Still, there is a sizable Puerto Rican population that includes my mother’s side of the family and a community I never felt completely included within. I am a quasi-native Spanish speaker—while I may not be 100 percent fluent or grammatically correct, I can speak my mother’s language. But I often have to prove I can speak the language, talk the talk. For many people, I don’t look Latin enough: my skin is too dark, my hair too coarse (even with a relaxer) to be acknowledged as such. Though the Afro-Latinx movement has ignited conversations about multiculturalism, and outspoken advocates like Amara La Negra have made headlines, assumptions about my background continue. I’ll walk into a store in an area where I know the de facto language is Spanish. Sometimes an employee follows me, sometimes they don’t. I take my items to the register and address the cashier in Spanish. Some people won’t miss a beat and continue the conversation in Spanish as they would with anyone else. A fraction of those are more friendly than they would have been otherwise, perhaps because they feel more comfortable speaking in their native language or because they now see me as less of an other. But most of the time, I’m met with the question that makes most people of color roll their eyes. “Where are you from?” they ask me in Spanish. Some simply respond to me in English without acknowledging that I addressed them in our shared language. In both cases, these interactions are impersonal. I am no longer an individual, but a representative of the monolithic group they believe the black race to be. What they really want to ask is: “How can this negrita speak Spanish without a gringa accent?” In this world, I have failed to pass the brown paper bag test to be Latinx. They are unable to process my hair, my skin, and my words together. They avoid having to face their own prejudice by asking me why I am like this, and by responding to me in English, hint that I should be speaking in English, too. My experiences abroad in Nigeria and at home in Miami have made me feel like I will never have full access to either culture. But the disconnect is not because of my language abilities or my natural hair—it exists because conversations about intersectionality have not fully penetrated these worlds I inhabit. The opaque walls have become fences we can see through, but there are still barriers to be broken. Ones that I hope to break.